‘Plaster Your Number Day,” started by Holly and Lucia, got me thinking today. A year ago I would have been horrified to share my weight with anyone, and yet there I was telling my entire friends list my weight! It became evident from other people's posts, that weight is really not so important as other factors. 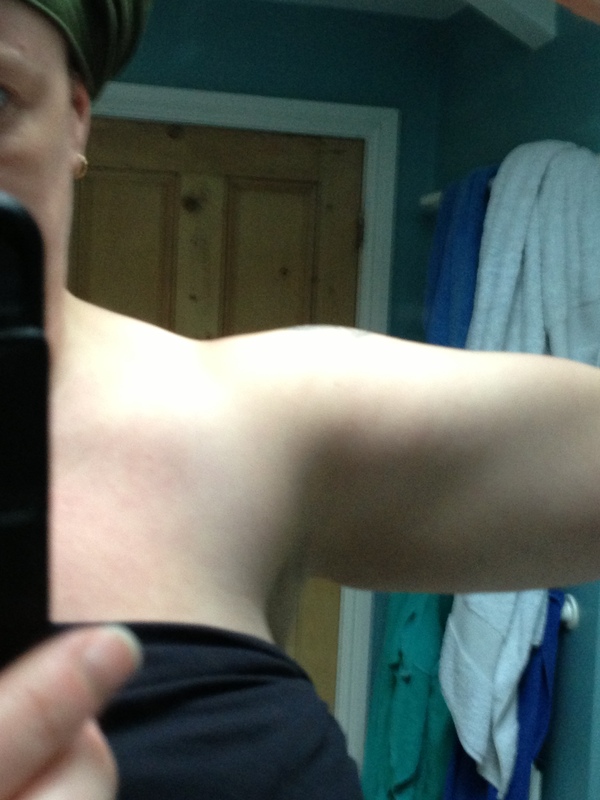 Especially as I see on the forums at this time of year,' I've only lost 18 pounds in 3 weeks and now I've plateaued!' etc. etc. I am not mocking these posts, it is how society has brain washed us into believing our worth, and we also expect almost instant results from little effort. So I would like to list a few pretty unexpected benefits that I have had since eating more and lifting heavier for all these months. None of these have anything to do with weight, body fat or clothes size. 1. Posture. An amazing result for me, I have been a round shouldered old woman looking thing since a teenager. Try as I might to keep my shoulders back, it hurt and I would slouch back into sack of potatoes position. I noticed one day, how my shoulders are now right back, without trying or thinking about because my supporting muscles are now strong and doing what they are meant to do. 2. Sleep. I always felt I slept pretty good, but now I notice the quality of my sleep. I sleep so soundly, and I make sure I get enough of it too, because I know how important it is, so I won't skimp anymore. 3. Feeling strong. Might seem obvious, but I don't mean getting new PR's with deadlifts or squats ( well there's that too!) I mean day to day feeling strong. Carrying loads of grocery shopping and not even noticing the weight, bringing in wood for the fire with ease, moving furniture that would have previously been too heavy, things like this. 4. Skin, hair and nails. My nails are strong and don't snap like they used to. My complexion is always clear and glowing. My hair just keeps on growing! 5. Feeling happy. seriously I feel so content because I know I am looking after myself, I am not starved, over exercised, not stressed out over the whole ‘must lose weight, must lose weight' philosophy any more. 6. No need to binge. I have not once now for months, felt like over eating anything! I didn't think I used to, but realized I used to carb load at the weekends. I don't need cheat meals, cheat days etc because I can work anything I feel like into my macros and daily totals. I never feel deprived or hungry. 7. Getting my sass back! I feel so much more confident as its all about loving yourself and loving your amazing body and being thankful for everything it does for you every day. 8. Having the truly most amazing friends here on MFP who help and support me and from whom I have learned so much about nutrition, lifting, patience and acceptance. It's so not all about the scale, the calipers or even the tape measure. This is a lifestyle that is doable for life. Once you start to love all the other benefits, the other things will soon fall into place. And if it takes me a long time to get there, that's fine with me, I'm in no hurry. Great article and so true. I have noticed many of the same things, with my self-confidence and hair growth, so exhausted with just the number on the scale. Its so much more. Those are awesome NSVs, ones that I’ll be honest I never really think about. Congrats on your continued success. I also read your previous post and I’m so sorry for the loss of your mom but wanted to say you are amazing for breaking through the pain and setting a great example for your kids. Your daughter’s quote at the end made me smile. Ichel girl you have enough NSV to carry you for a long time. Those are the benefits that people on the “weightloss” journey take for granted or even give thought to. I especialy love the hair, skin and nail growth ou mentioned. The MFP is flooded with people using suppliments and even Monistat cream for hair growth instead of good old fashioned FOOD!!! I am so proud and happy for you. Keep pushing girl, you are ready for battle!